Hello everyone and welcome back to my blog! 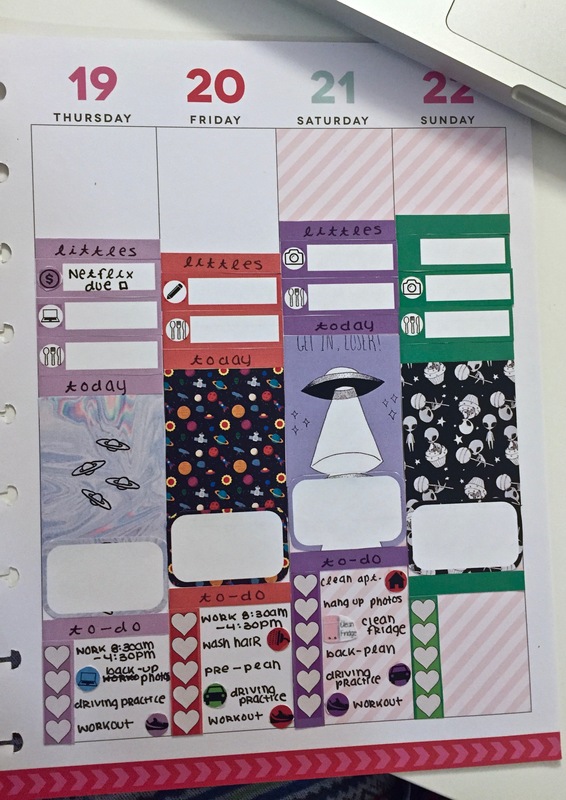 Today’s post is going to be a plan with me, which to be completely honest I’ve been feeling very out of sorts when its come to planning this month. 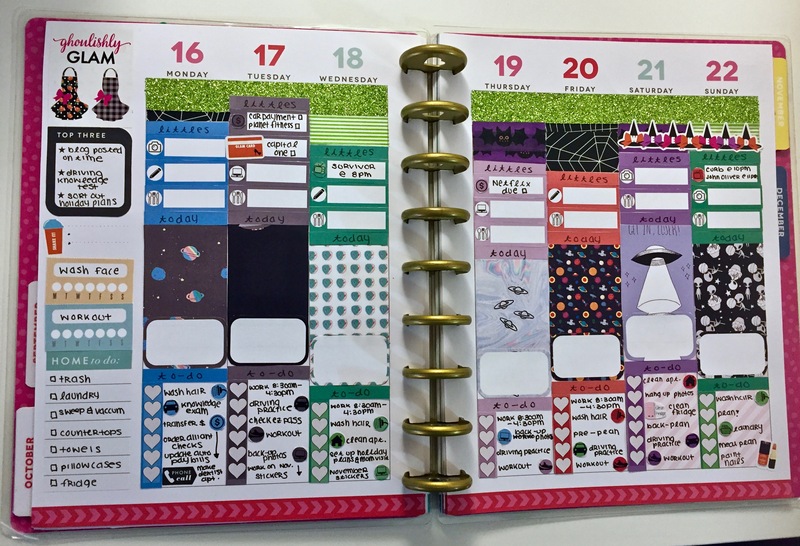 I’m hoping that with Halloween getting closer, I’ll be enjoying the planner spreads I have planned for the coming holidays. Check out this week’s plan with me below! 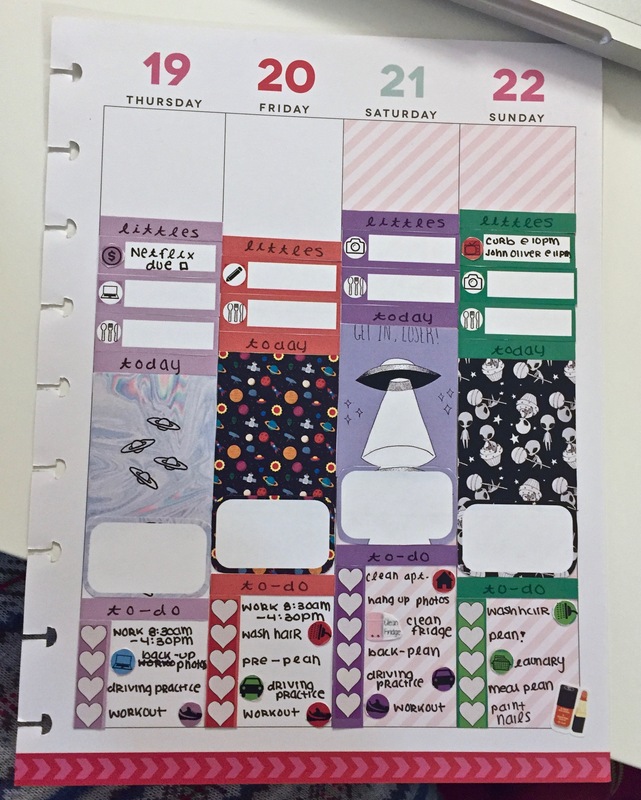 The planner I use is a Happy Planner, and the spread I went with this week is themed around aliens. All the images I found for this spread were found on Pinterest, and the rest of the kit I created in Apple Pages. This is the first of the Halloween spreads I have planned, and I decided to go with a more unusual Halloween idea for the first kit. Typically Halloween spreads are all about the usual themed ideas – candy, witches, vampires, etc. Aliens are another “spooky” idea that I just haven’t seen a lot of for kits, so I thought it would be a bit of a Halloween experiment. Getting straight into Monday, my boyfriend and I have the day off of work (YAY for long weekends! ), so we have quite a bit planned to do. Starting off with little things, I want to prep some more future blog posts, post this plan with me, and I will note our dinner as per the usual. In my today section I left it blank with a half box to back plan later for memory keeping. My To-Do section is jammed with tasks, I plan on washing my hair, making dentist appointments for the both of us, and taking my written exam for the driving test. I also have a few tasks related to setting up a new bank account and updating our bill payments. Tuesday is my heavy day of the month for bill payments. I have the car payment due, my Planet Fitness membership due, and a payment for my credit card due (sticker from Paper & Glam). I also will be posting over on my My Trending Stories account, and I will also be keeping track of my dinner. For to-do’s, I return to work, need to make sure our EZ Pass is paid, and want to practice driving and workout. I also really need to get a head start on my November sticker spreads and back up all my photos off of my laptop. Wednesday’s little things start with a new episode of Survivor on, which I really need to catch up on already. I also will hopefully have another blog post up and will note our dinner for the night. In terms of to-do’s for Wednesday, it’s another work day and a hair washing day. I try to clean my apartment during the middle of the week, and I also need to finish up November stickers. The last big task of the day is to get started on holiday planning, as well as setting up a day for my Mom and Grandma to come visit for my birthday. Thursday is a break in the craziness of the week, my little things section only has my Netflix payment due, a post on My Trending Stories, and my dinner tracker. As for my to-do list, I have work once again, I will still mostly likely be backing up all the photos on my laptop, and I really need to keep up with driving practice. I also am trying to stay on top of working out at least four times a week. 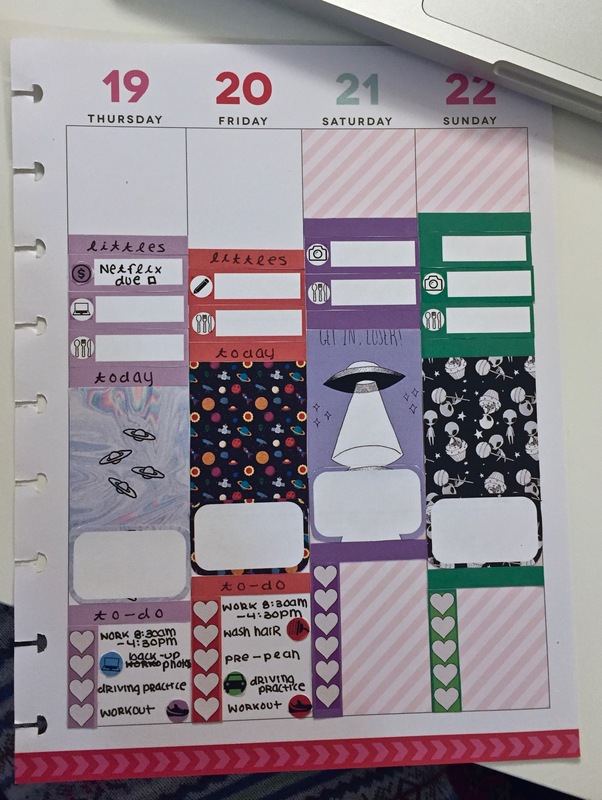 Friday is slightly busier, though my little things section has only a blog post and my dinner tracker. My to-do list includes my work schedule and a reminder to wash my hair. I also need to pre-plan for next week, practice driving again, and hit the gym. Saturday is much crazier for the to-do section, as I plan on doing my weekly heavy clean this day. I also need to hang up some artwork we have sitting around and I need to focus on cleaning our fridge for my main cleaning task. I also need to back plan for this week, as well as practice driving and work out. As for the little things, I have blog prep as well as my dinner tracker. To round out our week, Sunday’s little things starts with two new TV episodes to watch, Curb Your Enthusiasm and Last Week Tonight with John Oliver. I also have to do more blog prep and record our dinner. For my to-do list, I need to wash my hair, plan in my planner for next week, and meal plan for the next week as well. I also have to do our laundry, and I would like to paint my nails. 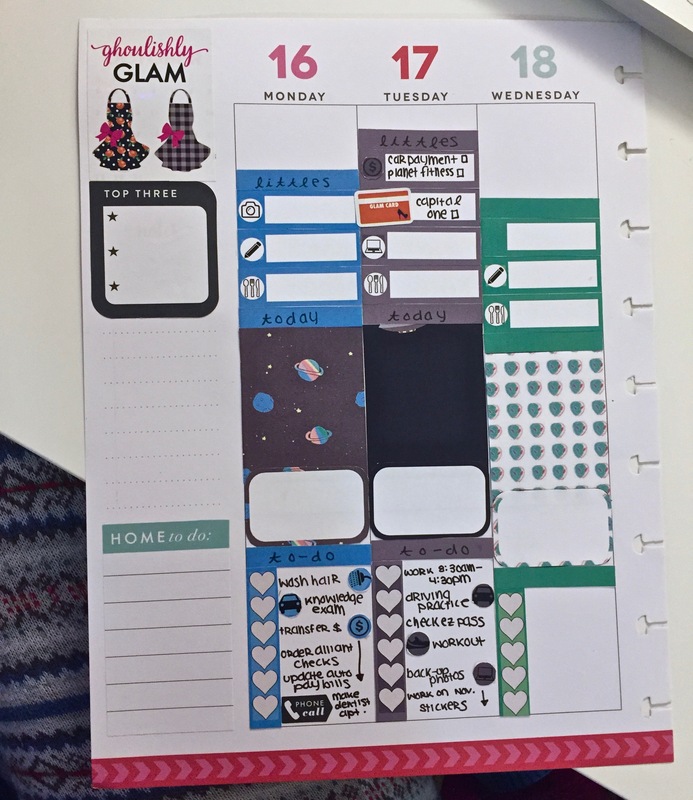 For my weekly sidebar, I started off with a decorative box from Paper & Glam and added a top three box from a Happy Planner sticker book. 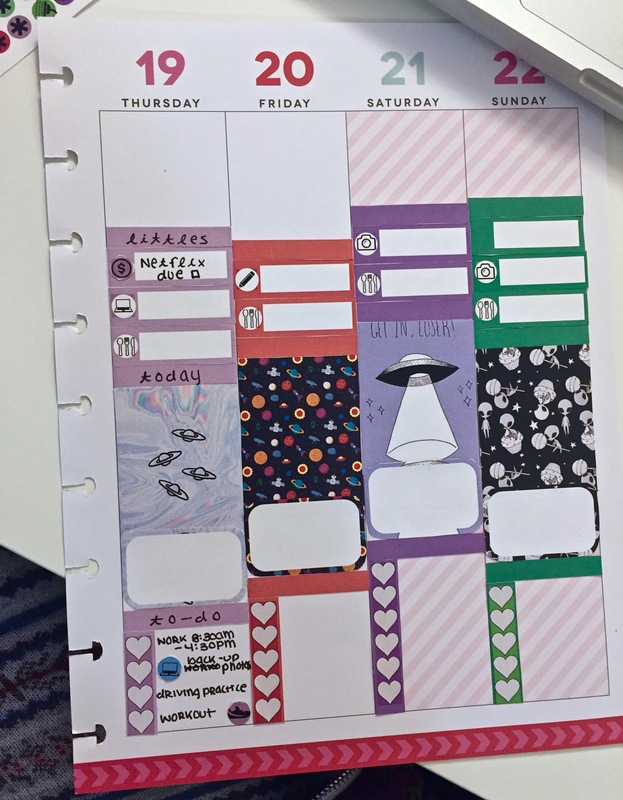 My top three goals for the week include getting my blog posts up on time, passing my written driving exam, and sorting out of holiday plans for this year. 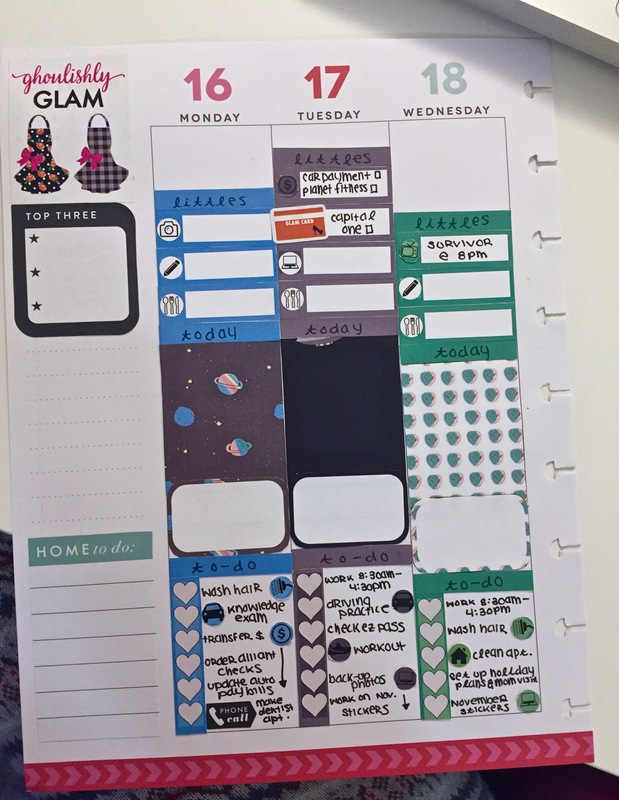 I added a Paper & Glam workout sticker underneath to record my weekly stats (miles run, overall reps done, etc.). I then added two habit boxes, one for washing my face everyday and one for working out. 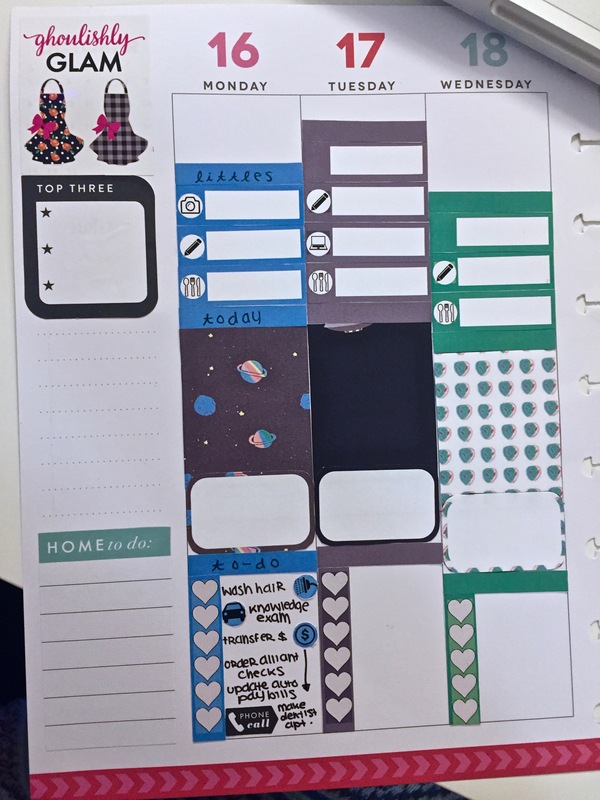 Lastly, I added a checkbox from a Happy Planner sticker box labeled “Home to do,” which I used to create a weekly cleaning checklist. 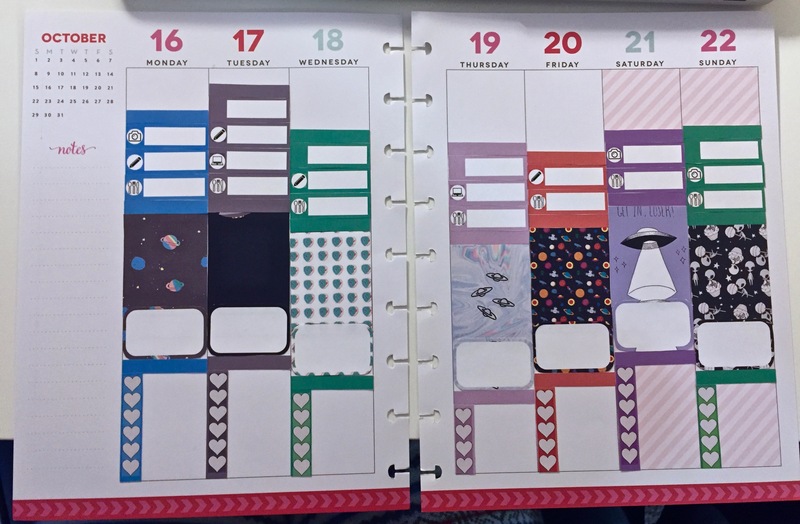 To finish off my planner spread, I added in green glitter washi tape along the top, and then added various decorative washi to fill in the white space about the little things section. I also added a weekend banner from Paper & Gam to celebrate the freaking weekend! I love how this turned out, it’s not super halloween-y, but it’s enough to get me in the spooky mood. This spread also really makes me want to watch X Files again, so that’s that. So there we have it, my weekly plan with me for October 16th-22nd! 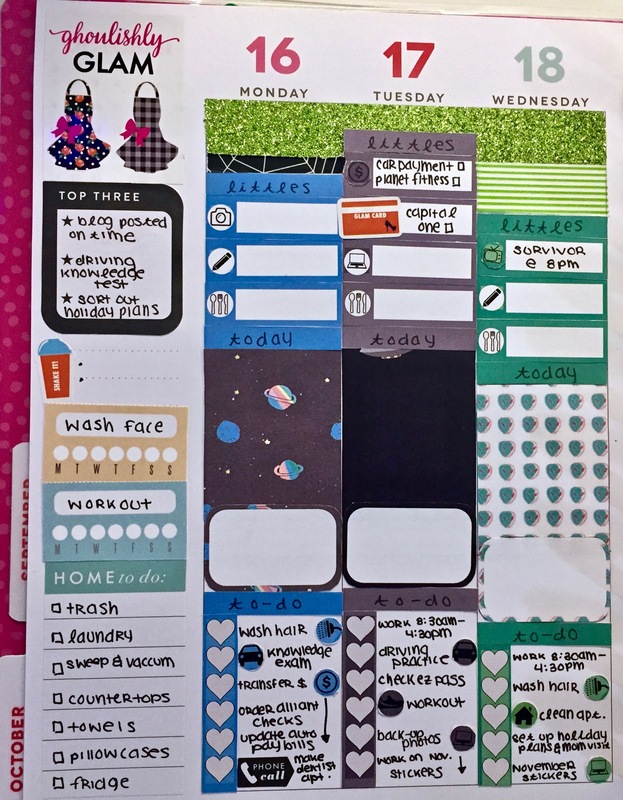 What planner spread are you using this week? Let me know in the comments below! See you next time! I like how your set up looks!